Year 2013 was damp with well distributed rainfall for us in S. Kona, at least – a total of 58.3 inches compared to the 46.3 inches in 2012, giving our coffee lots of moisture and making our crops far healthier than the year before. Already in January 2014, we’ve recorded 6.68 inches and February 2014, 2.63 inches at the 1900 foot level! Reminder to finish pruning off the old stuff by the end of March so the new vigorous growth can take place and– fertilize too by April, so your coffee has everything it needs. Information is available for you! KCFA’s Coffee Talk will have a CBB- Farm Health, March 13 from 9-11 at CTAHR info here– not to be missed if you want scientific reasoning on what to do now! Bring your questions and get answers from the experts- Suzanne Shriner from KCFA and Andrea Kawabata from CTAHR. March 17- Spray Equipment Calibration & Calculation: info hereand March 19 –Coffee Berry Borer Integrated Pest Management Workshop #2 info here. Be wise and take advantage of the education offered. Wishing you a great 2014 crop; take advantage of the Workshops so you can use your time wisely in combating the nasty CBB pest and keeping your farm healthy. CBB MITIGATION—HB1514: This bill was introduced by Kona Representative Nicole Lowen. As originally drafted, the bill provided for a $3 million appropriation to the Hawaii Department of Agriculture (HDOA) for control and mitigation of coffee berry borer (CBB). The KCFA has supported the bill—with a strong recommendation that the appropriation be used to subsidize farmer costs for purchasing Beauvaria bassiana, and that the HDOA directly administer the subsidy program—and not sub-contract out the program to private organizations. HB1514 has passed through 3 House committees and continues to progress through the Legislature. Unfortunately, the latest draft of the bill (HB1514/HD1) has removed the prior $3 million in appropriations and instead put blanks into the bill—to be filled in later. So at this point it is unclear how much—if any—will actually be appropriated for Beauvaria bassiana subsidies to farmers. 10% Hawaiian Chocolate Blend Bill—SB1327: Testimony in opposition to this bill from cacao growers and from KCFA members seems to have killed the bill. Testimony presented to the Senate Agriculture Committee hearing on this bill from coffee growers asked that the system of 10% blends, which has for years damaged the reputation of Hawaii-grown coffee, not be extended to other crops like chocolate. Many Hawaii chocolate producers asked in their testimony that the bill not be passed unless at least 51% of a blend consist of Hawaiian-grown chocolate and that the origin of the non-Hawaiian-grown chocolate be stated on the label. On February 11 the committee deferred (killed) the bill. Coffee Labeling—SB2354 and HB1515: At the request of the KCFA, Hawaii County Senator Russell Ruderman introduced SB2354 and Rep. Lowen introduced HB1515. These bills would have made a very modest step toward reforming Hawaii’s current 10% coffee blend law by requiring identification of the origin of the 90% non-Hawaii-grown coffee in a Hawaii coffee blend. The bills would have required, for example, a label to state “Contains: 90% Foreign-Grown Coffee; 10% Kona Coffee”. The power that the Honolulu blenders and their allies hold over the Legislature is illustrated by the fact that neither the Senate nor the House Agriculture Committees would even schedule a hearing on these bills. BILLS OF CONCERN FOR COFFEE FARMERS: Two bills (HB2361 and SB111) that are progressing through the legislature are of concern to coffee farmers. HB2361 would extend criminal penalties to violations of as yet unwritten administrative rules for grades and standards for roasted Hawaii coffee. For years, requirements for inspection and labeling of green coffee did not apply to green coffee that was roasted in the region where it was grown. The Honolulu blenders and their allies have testified in support of the bill. The potential new rules and burdens that may result to those of us who sell Kona coffee roasted in Kona are unclear at this point—but should be of concern. The second bill (SB111) “authorizes the Board of Agriculture to create ‘made in Hawaii’ labeling requirements for all agricultural commodities in Hawaii no later than July 1, 2015, through rules, which shall not supersede any state law regarding “made in Hawaii” labeling requirements for agricultural commodities enacted prior to the [bill’s]effective date.” It is very unclear what effect this bill might have on current coffee labeling requirements. It appears that the Legislature would, in any case, be abandoning its responsibility to determine policy—and instead giving that policy responsibility to an unelected Board of Agriculture. The bill contains no policy directives, no restrictions and no limitations from the Legislature as to what regulations the board might adopt. In the November 2013 INDEPENDENT VOICE we noted that Hawaiian Airlines President & CEO Mark B. Dunkerley had responded to a letter from KCFA President Cea Smith expressing concern about the airline’s giveaway of Hilo Hattie 10% Kona Coffee Blend samples. In his responding letter, Mr. Dunkerley advised that Hawaiian Airlines would discontinue the giveaway program by the end of 2013 and he expressed appreciation to KCFA for our “work in developing the market for Kona Coffee”. 2 – Send a note to Mark Dunkerly with a thank you for ending the giveaway and with a suggestion that it would help to further develop the Kona Coffee market if Hawaiian Airlines showcased the State’s premier specialty agricultural product by serving 100% Kona Coffee to passengers in first class on flights to and from the Mainland. A letter can be mailed to Mark B. Dunkerley, President & CEO, Hawaiian Airlines, PO Box 30008, Honolulu, Hawaii 96820; or by fax 808-838-6777.
ginab@hawaii.edu by March 14, 2014.
ginab@hawaii.edu by Mar. 18, 2014. I would like to point out some important benefits of having native forests, or even just islands of forest, on your coffee farm. Our forests exist nowhere else on this planet. Only 10% of Hawaii’s native dry forests currently remain. citation Perhaps they warrant space, an island, or even native tree plantings on your farm. We know a 10% blend is not sustainable! 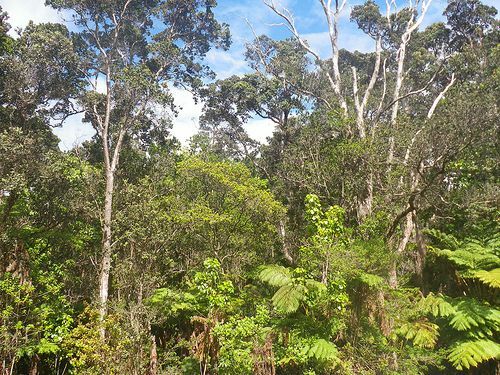 • Economic benefits of leaving intact Ohi’a forest include providing endemic Beauveria inoculum and genetic variation to possibly help mediate CBB, although there is no formal research presently to support this. An old growth forest could also provide supplemental food for Beauveria and habitat to complete its life cycle. Since Beauveria is a carnivorous fungus it needs to complete its life cycle to sporulate, which harvesting can impede, a stable forest presence could provide this. • Soil Health: Forest soil microbial population is primarily fungal, where grassland and herbaceous plant soil is primarily bacterial. 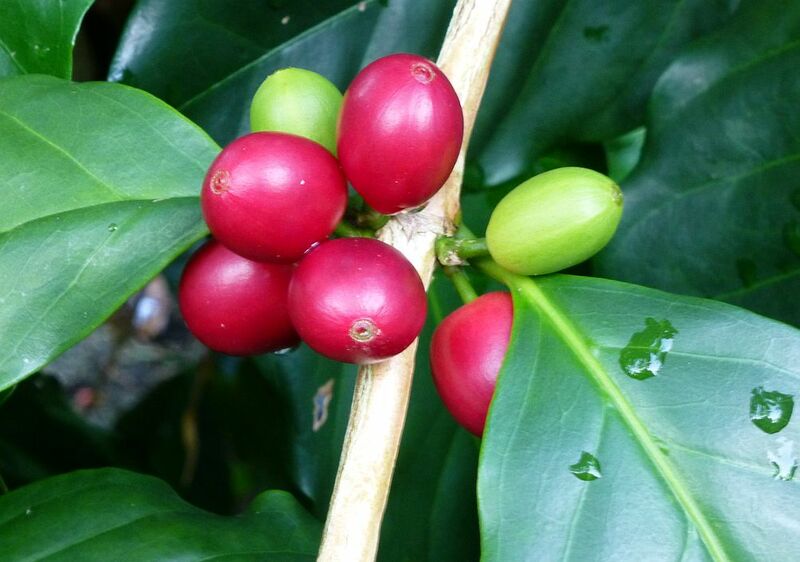 Coffea is originally an understory forest tree. Intact old growth Ohi’a forests have thousands of species of fungus and bacteria, many still yet to be identified. Many more of these fungi could be beneficial to farmers. Our orchard soil, where the ground cover is grass, may benefit from the many fungi inoculum from intact nearby forests. The Ohi’a’s and other native plants’ roots can slow water movement and prevent erosion of our so valuable soils. Hundreds of years of growth has produced an amazing underground array of fine roots and associated life. • Trees bring the rain. I have heard this local lore from a few different sources. Ohi’a means ‘to gather’ etc., and gather water it does. Ohi’a’s fine hair roots weave their way through cracks in the lava mining condensate or ground moisture and nutrients. This moisture can be translocated above ground to cool the tree and surrounding area (evapotranspiration). On the leaves where protective hairs occur, it can regulate moisture loss but also gather moisture, along with the aerial roots. • Carbon Sequestering: A new study correlates old trees, not young trees, due to larger root systems with much more carbon sequestering than was thought. Previous models did not account for soil carbon storage and the fact that at least half the carbon goes to trees root systems. citation There are enormous amounts of carbon in our old growth Ohi’a forests and when they are cut down the carbon is eventually released to the atmosphere. This is cited in this paper about shade coffee farming, some examples with Ohia trees. The Kamehameha butterfly (Vanessa tameamea) is found nowhere else in the world except for Hawaii. A recent request by the Pulelehua Project, a division of UH-CTAHR, was published in the daily Honolulu Star Advertiser asking for the community’s help in sending in observations and/or photos of this rare butterfly to document the distribution. 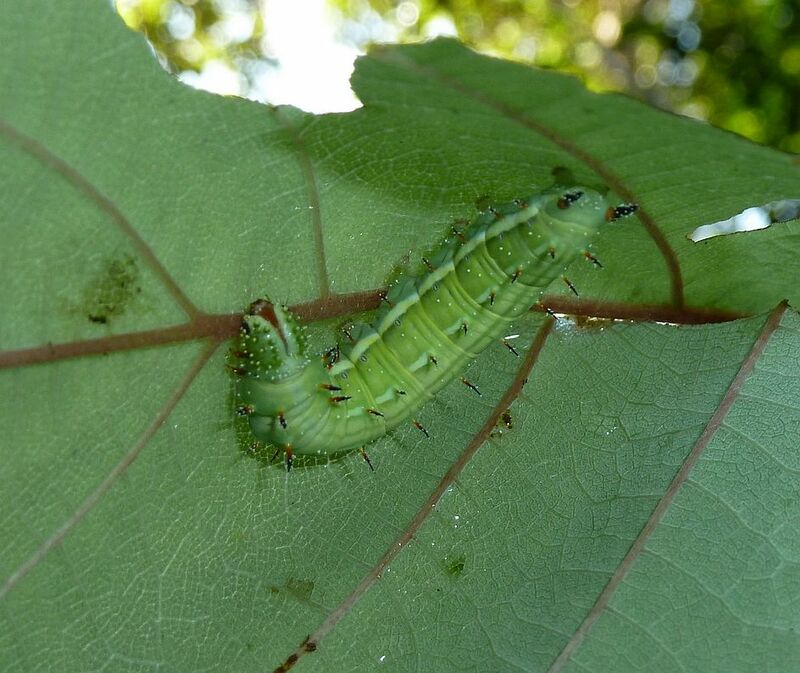 In 2011 as an avid observer of all things in nature, I found a Kamehameha caterpillar on the back of a Mamaki leaf near the 2000 foot elevation on our farm in Honaunau mauka. This is the photo. In order to encourage more Kamehameha butterflies, every Mamaki seedling is given encouragement on my farm. 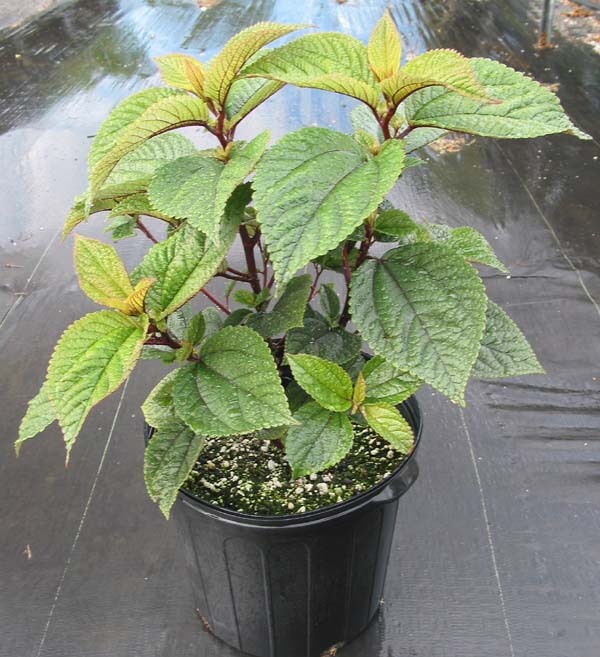 (On the Pulelehua Project website are several other “Host Plants”.) These butterflies were more common 10 or more years ago. One of the problems they face is Jackson Chameleons will eat the adults. I actually observed a Jackson get one a while back. The Meijiro/Japanese White Eye birds also eat the caterpillars. The Kamehameha butterfly is challenged at many levels. It might be difficult to distinguish a Kamehameha butterfly from a Monarch butterfly but comparison photos and more information is available here on their site. These butterflies are fast flying and one rarely sees them, even if you know what you are looking for. Good luck! Every performance we see at the Aloha Performing Arts Company (APAC) has been enjoyable and “Fiddler on the Roof” was one of the best. Our two free tickets were in exchange for a donation of about four pounds of 100% Kona coffee and were really good seats. Additional benefits included advertising on a poster at the refreshment counter and in the program. The poster and ad also provide a lot of information about KCFA. Since we don’t sell our coffee locally, except here at the farm, the advertising probably won’t create sales; so we consider our contribution to be a donation to a worthwhile local production company while spreading the word about KCFA. This is a good way to have our community enjoy 100% Kona coffee and for KCFA to support an enterprise that serves only 100% Kona. This is the way to make the real stuff with no fluff. It was made in Shannon Airport to warm up travelers after long trans-Atlantic flights. Here we can enjoy it for St. Patrick’s Day even if we don’t need to be warmed up and of course with 100% Kona Coffee to make it as good as it gets. In a small prewarmed mug, dissolve the sugar in the coffee. Stir in the whiskey. Slowly pour in the cream over the back of a spoon — the aim is to have it form a distinct layer on top, through which you sip the bracing black stuff beneath. Enjoy.